Legumes include many very important crop plants that contribute very critical protein to the diets of both humans and animals around the world. Their unique ability to fix atmospheric nitrogen in association with Rhizobia enriches soil fertility, and establishes the importance of their niche in agriculture. Divided into two volumes, this work presents an up-to-date analysis of in vitro and recombinant DNA technologies for the improvement of grain, forage and tree legumes.§Volume 10A examines the current status and future prospects of challenges of the following: in vitro morphogenesis; biotic and abiotic stress tolerance; genomics; nitrogen fixation and utilization; nutritional improvement, and biodiversity of wild and tribal legumes.§Volume 10B presents the current state and future prospects of in vitro regeneration and genetic transformation expression and stability of transgenes modification of traits in almost all the important legumes, for example: soybean; peanut; pea; french bean; chick pea; pigeon pea; cowpea; mung bean; black gram; azuki bean; lentil; Lathyrus; lupinus; Lotus spp; Medicago spp; Trifolium spp; Winged bean; Guar; and tree legumes for their improvement. 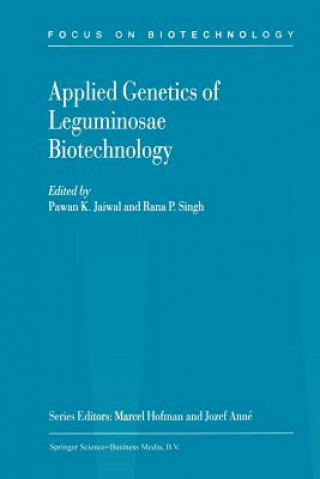 Written by international experts, these volumes will be of great value to researchers, as well as graduate students and all those requiring an advanced level overview of the subject area.Legumes include many very important crop plants that contribute very critical protein to the diets of both humans and animals around the world. Their unique ability to fix atmospheric nitrogen in association with Rhizobia enriches soil fertility, and establishes the importance of their niche in agriculture. Divided into two volumes, this work presents an up-to-date analysis of in vitro and recombinant DNA technologies for the improvement of grain, forage and tree legumes.§Volume 10B presents the current state and future prospects of in vitro regeneration and genetic transformation expression and stability of transgenes modification of traits in almost all the important legumes, for example: soybean; peanut; pea; french bean; chick pea; pigeon pea; cowpea; mung bean; black gram; azuki bean; lentil; Lathyrus; lupinus; Lotus spp; Medicago spp; Trifolium spp; Winged bean; Guar; and tree legumes for their improvement.